Athens in March? Yes! For the International Law School Mediation Championships. The international competition designed to help students understand the value of resolving disputes through mediation so that they can apply it in their personal and professional lives. 1. The tournament provides 2 days of mediator training followed by 2 days of competition rounds – mediation simulations. 2. Teams have the opportunity to network with other students from around the world. 3. A unique opportunity to introduce yourself to the world of mediation, which is critical to a successful professional practice after graduation. Register your team of three students today! 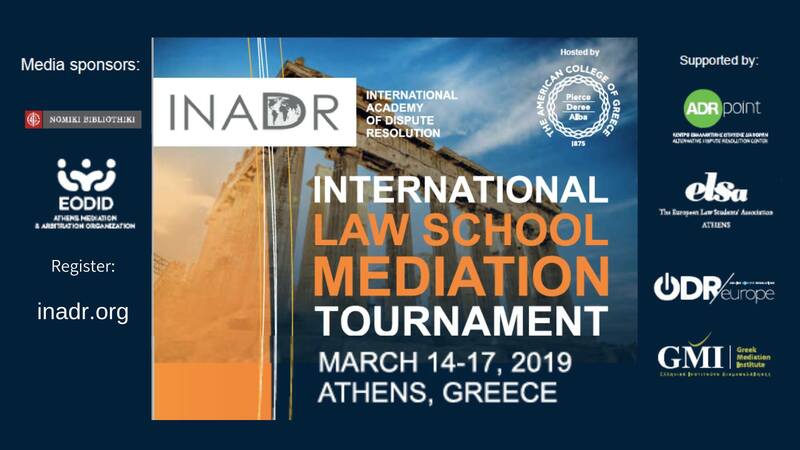 For more details and the registration form follow the link: http://www.inadr.org/event/2019-inadr-international-law-school-mediation-tournament-2/?instance_id=122. Registration deadline: January 18, 2019. Experienced professionals can apply to join as judges. Application form to be uploaded soon! With any questions, please contact INADR The InterNational Academy of Dispute Resolution or the event organizers: INADR International Mediation Tournament, Athens 14-17 May 2016.